The dsp.UDPReceiver System object™ receives UDP packets over a UDP network from a remote IP address specified in the RemoteIPAddress property. The object then saves the data to its internal buffer. The amount of data (number of elements) received in each UDP packet can vary. The maximum number of bytes the object can receive without losing data is set by the ReceiveBufferSize property. The MaximumMessageLength property specifies the maximum number of samples each data packet can contain. The LocalIPPort on which the object receives the data is tunable in generated code but not tunable during simulation. For an example, see Tune the UDP Port Number in MATLAB. Create the dsp.UDPReceiver object and set its properties. udpr = dsp.UDPReceiver returns a UDP receiver object that receives UDP packets from a specified port. udpr = dsp.UDPReceiver(Name,Value) returns a UDP receiver object with each specified property set to the specified value. Enclose each property name in single quotes. Port on which to receive the data, specified as a scalar in the range [1 65535]. This property is tunable in generated code but not tunable during simulation. Address from which to accept data, specified as a character vector or a string scalar containing a valid IP address. Entering a specific IP address blocks UDP packets from other addresses. The default, '0.0.0.0', indicates that the data can be accepted from any remote IP address. Size of the internal buffer that receives UDP packets, specified in bytes as a scalar in the range [1 67108864]. If the number of bytes received exceeds this value, the buffer overflows and the contents are truncated. Maximum length of the output message, specified in samples as a positive scalar in the range [1 65507]. Set this property to a value equal to or greater than the data size of the UDP packet. If you receive more samples than specified in this property, the excess data is truncated. Data type of the vector elements in the message output, specified as a MATLAB® built-in data type. Match the data type with the data input used to create the UDP packets. Complexity of the message, specified as either true or false. Set this property to true if the received message is complex. Set the property to false if the received message is real. dataR = udpr() receives one UDP packet from the network. Data received from the network, returned as one packet. The MaximumMessageLength property specifies the maximum number of bytes each data packet can contain. Length of the data received is the number of bytes received from the network. The data is received as complex data if the IsMessageComplex property is set to true. Send and receive UDP packets using the dsp.UDPSender and dsp.UDPReceiver System objects. Calculate the number of bytes successfully transmitted. Set the RemoteIPPort of UDP sender and the LocalIPPort of the UDP receiver to 31000. Set the length of the data vector to 128 samples, which is less than the value of the MaximumMessageLength property of the receiver. To prevent the loss of packets, call the setup method on the receiver object before the first call to the object algorithm. In each loop of iteration, send and receive a packet of data. At the end of the loop, use the fprintf function to print the number of bytes sent by the sender and the number of bytes received by the receiver. The local IP port number of the dsp.UDPReceiver object and the remote IP port number of the dsp.UDPSender object are tunable in the generated code. Generate a MEX file from the receiver function which contains the algorithm to receive sine wave data over a UDP network. Change the remote IP port number of the UDP receiver without regenerating the MEX file. Verify the number of bytes sent and received over the network. Note: This example runs only in R2017a or later. The input to the receiver function is the local IP port number of the dsp.UDPReceiver System object™. The output of this function is the number of bytes received from the UDP network. The dsp.UDPSender object with remoteIPPort number set to 65000 sends the data over the UDP network. The dsp.UDPReceiver object with LocalIPPort number set to 65000 receives the data from the UDP network. The data is a sine wave containing 250 samples per frame. The data is sent and received successfully over the UDP network. The initial data is dropped due to overhead. Generate a MEX file from the receiver.m function. Release the sender and change the RemoteIPPort number to 25000. The LocalIPPort number of the receiver continues to be 65000. Since the port numbers are different, the data is not transmitted successfully. Clear the MEX file and change the local IP port number of the receiver to 25000. Clearing the MEX enables the receiver port number to change without having to regenerate the MEX. The port numbers of the sender and receiver match. Verify if the data is transmitted successfully. The data is transmitted successfully over the UDP network. The initial data is dropped due to overhead. Compute the STFT of a sine wave and transmit the complex STFT data over a UDP network. At the receiver side, compute the ISTFT of the received data. Visualize the data sent and the data received using a time scope. The dsp.UDPSender object can send complex data. In order to enable the dsp.UDPReceiver object to receive complex data, set the IsMessageComplex property to true. Initialize the dsp.STFT and dsp.ISTFT System objects with a periodic hann window of length 120 samples and an overlap length of 60 samples. Set the FFT length to 128. The input is a sinusoidal signal with a frequency of 100 Hz, a sample rate of 1000 Hz, and with 60 samples per each signal frame. 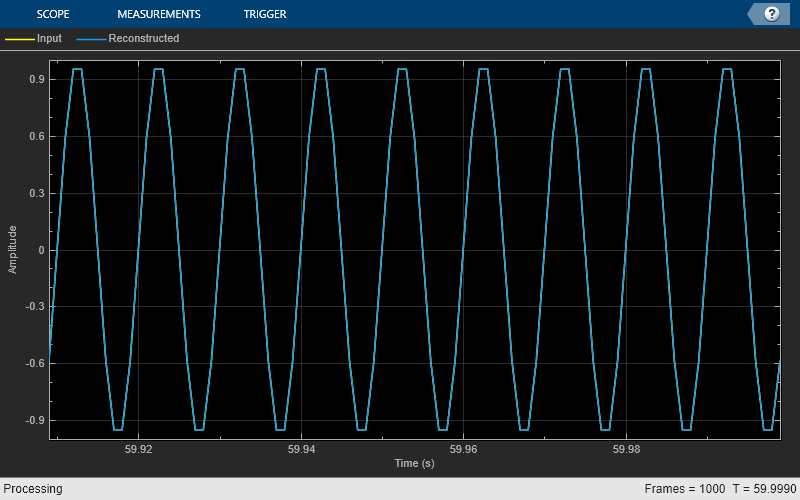 Initialize a dsp.TimeScope object with a sample rate of 1000 Hz and a time span of 0.09. The Delay object corrects the overlap length while comparing the input with the reconstructed output signal. Transmit complex STFT data of the sine wave over the UDP network. Compute the ISTFT of the received data. Compare the input, x, to the reconstructed output, y. Due to the latency introduced by the objects, the reconstructed output is shifted in time compared to the input. Therefore, to compare, take the norm of the difference between the reconstructed output, y, and the previous input, xprev. Visualize the signals using a time scope. You can see that the reconstructed signal overlaps very closely with the input signal. The norm of the difference is very small, indicating that the output signal is a perfectly reconstructed version of the input signal. Some of the packets sent can be lost during transmission due to the lossy nature of the UDP protocol. To check for loss, compare the bytes sent to the bytes received. The executable generated from this System object relies on prebuilt dynamic library files (.dll files) included with MATLAB. Use the packNGo function to package the code generated from this object and all the relevant files in a compressed zip file. Using this zip file, you can relocate, unpack, and rebuild your project in another development environment where MATLAB is not installed. For more details, see How To Run a Generated Executable Outside MATLAB. The LocalIPPort property is tunable in generated code but not tunable during simulation.